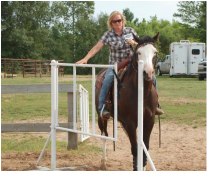 This is a brief description of our Working Ranch Horse class. This class combines three functions. The reining ability, cow sense and positioning in order to rope and stop a cow. 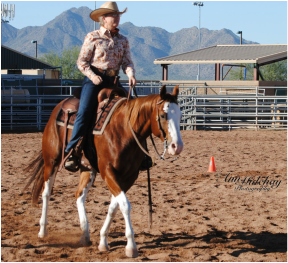 ​Reining – There are three (3) approved patterns for this class. Maneuvers include at least one circle in both directions, changing leads in each direction, at least one 360-degree turn in each direction, a rollback in each direction, stop and back. The reining patterns can be found at Forms tab. 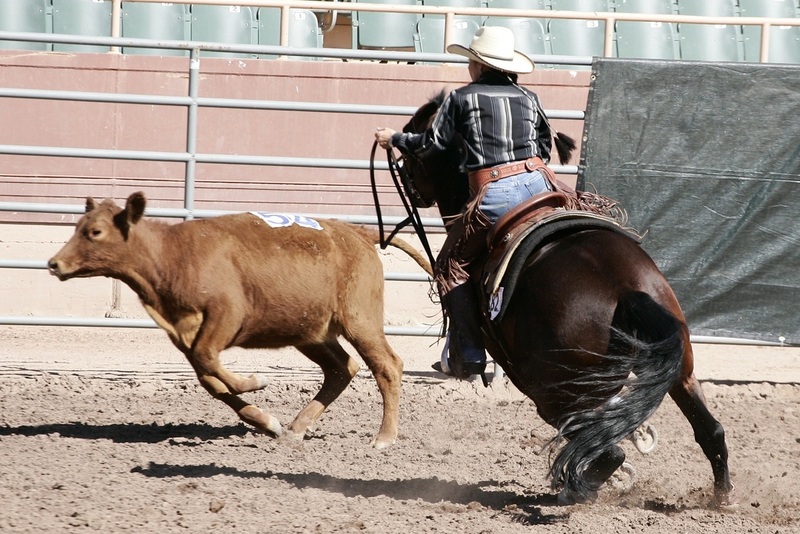 Working the cow – After the rider completes the reining pattern, the cow will be called for. Be sure you are very clear to the cattle handlers as to when you are ready for your cow. One cow will be turned out into the arena. Depending on the Division, upon receiving the cow, you will exhibit your horse’s ability to work the cow in the designated end of the arena for a sufficient amount of time. Then you will take the cow down the fence making at least one turn each way. Make sure on your first turn you have passed the center marker before making that turn, otherwise, there is a penalty. 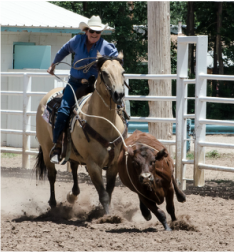 Roping or Circling – The Amateur, Youth Advanced Divisions and Open Division perform this part of Working Ranch. The rider has 4 minutes to perform this class with a 2 minute remaining warning. Roping - The rider is judged on how rope handling and stopping of the cow. The horse is judged on its ability to rate, track, and stop the cow. You are allowed two loops to be thrown in catching the cow. 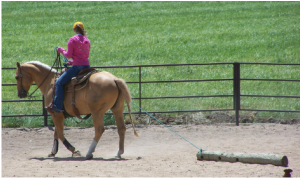 The rider’s rope cannot be tied hard to the saddle horn. It is not necessary for the rider to make a catch. However, there are penalties associated with not catching. If using a breakaway there are also associated penalties. ​Circling - The rider is judged on how the cow is maneuvered at least 360 degrees in each direction without interference from the fence. This is a brief description of our Ranch Trail class. 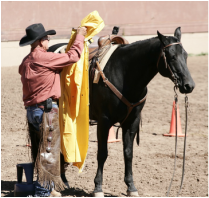 The Ranch Trail class is designed to show your horses willingness to perform several tasks that might be asked of him during the course of a normal work day on the ranch. This class consists of 7 obstacles. Three are mandatory; 1) opening, passing through and closing a gate, 2) dragging a log and 3) dismount, ground tie, drop your bridle and re-bridle, pickup all 4 feet and remount. The horse will be judged on three gaits; the walk, trot and lope being performed between the obstacles. Opening and closing a gate. This can be performed several different ways. Be sure to consult your trail pattern for specifics. If you have questions or need clarification ask your event manager and/or judge prior to the class starting. The judge is unable to help you after the competition begins. When performing the gate maneuver you are not to let go of the gate at any time until you are finished. Letting go of the gate results in a penalty. Dragging a log. This can also be performed several different ways. Again, be sure to consult your trail pattern for specifics. If you have questions or need clarification ask your event manager and/or judge prior to the class starting. Credit is given as to how smooth and quiet the horse performs this task. Some of the other/optional obstacles may include crossing a water hazard, or a bridge, side passing over a log, carrying a slicker from one spot to another, roping a stationary steer etc.. Whenever possible, natural or realistic obstacles are encouraged. This is a brief description of our Ranch Riding class. This class is ridden and judged individually. The patterns truly show how broke and responsive your horse is to your queues. The Ranch Riding patterns can be found by clicking here: Forms. The patterns will have you walk, trot and lope in both directions, stop and back. 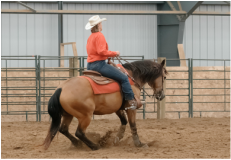 A ranch horse is expected to perform these functions at smooth working speeds. The judge is looking for smooth transitions between gaits, keeping the correct lead and maintaining the correct gait between markers. 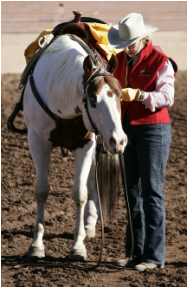 A rider must show his horse with only one hand on the reins, unless the horse is five years old or younger and is being shown in a snaffle bit or hackamore (bosal). This is a brief description of our Ranch Cutting classes. You have two and one-half minutes to perform this class will a one (1) minute remaining warning. Novice Amateurs and Youth Novice will sort a specific numbered cow out of the herd and demonstrate the horse’s ability to work the cow in the center of the arena and keep it from the herd. Once the rider is satisfied that the horse has proven its cutting ability, you must pen the cow which is located at the far end of the arena. The cow must pass between the wall and a cone/marker and then be penned. If the cow does not pass between the wall and cone/marker or if you do not pen the cow, there is a penalty. Limited Amateur, Amateur, Youth Limited and Youth Advanced Divisions and Open Division riders will sort two cows of their choice and demonstrate the horse’s ability to work the cow in the center of the arena and keep it from the herd within the two and a half minute time. Conformation is based on the structural correctness, balance and functional ability of the horse. In NVRHA, the horse’s form, meaning its’ structural correctness and balance, combined with function, meaning its performance in the cutting, riding, working cow and trail classes, establishes the Ranch Conformation score. We call this “Form-to-Function”. Novice Amateurs, Limited Amateurs, Amateurs, Youth Novice, Youth Limited, and Youth Advanced will walk their horses to the judge one at a time, stop, and setup. The judge will look at your horse from many angles. Bear in mind that setting up and presenting your horse properly can add a great deal of appeal. 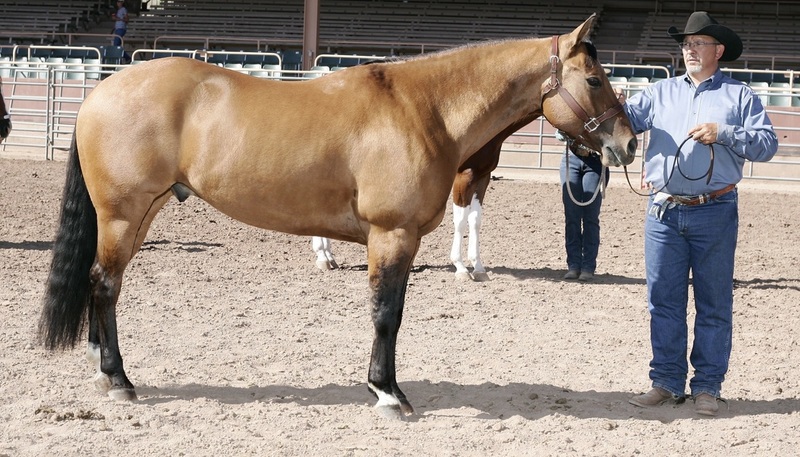 Know your horse's assets and liabilities and work with them the best you can. You will then trot off to a cone, turn left and continue trotting to the second cone, turning another left at a trot stopping at third cone for review by the judge at a distance. If you need additional instruction on preparing for this class, be sure to request this at a NVRHA clinic that you attend. This conformation class is performed as a lineup and is based on the structural correctness and balance. See the NVRHA’s score sheets for all 5 classes for the system of scoring. The pluses and minuses as well as minor and major penalties are clearly described. For further information on this category, refer to our current Rules & Regulations, or, contact us for any clarification of this event.